It doesn't snow at the south pole. Small quantities of ice crystals fall from a clear blue sky, but the vast majority of the snow here blows in from the rest of the continent. To put that in perspective, and give an idea of the winds here, the station sits on 2+1/2 km of ice. Yes, kilometers, yes, I mean 2+1/2 straight down, and yes, it all blew here from somewhere else. The old station, a geodesic dome 50' high, is now largely covered by snow. It's hasn't sunk at all, snow has accumulated to the point that it's no longer above ground. The previous station is completely covered, with not sign it ever existed visible from the surface. 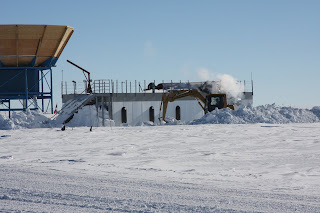 The new station is on stilts, and angled to coax the wind to clean out any accumulation beneath it. ASTRO, a building in the dark sector from the early 90s, was also placed in stilts, 20 feet off the ground (comparable to the ones the station stands on). The snow now covers its windows, and yesterday a crew was busily trying to dig it out. A couple more years and it will be gone. That's the fate of every building across the antarctic - to slowly sink beneath the ice. The continent is peppered with old US and Soviet stations, frozen in time and preserved beneath the surface. From time to time, people explore the old bases, provided they can find them and dig a tunnel in. They're still full of supplies, old magazines, food, and personal items. According to everyone who's been in them, they're utterly surreal, something out of a movie. It's odd to work in and with the SPT, knowing that it's only got a 10-20 year life before it, too, disappears beneath the ice. For all its beauty, this is a strange place, with shifting snows like the sands of an Arabian fairytale.